This story was sent to us by Vandana Kadyan. 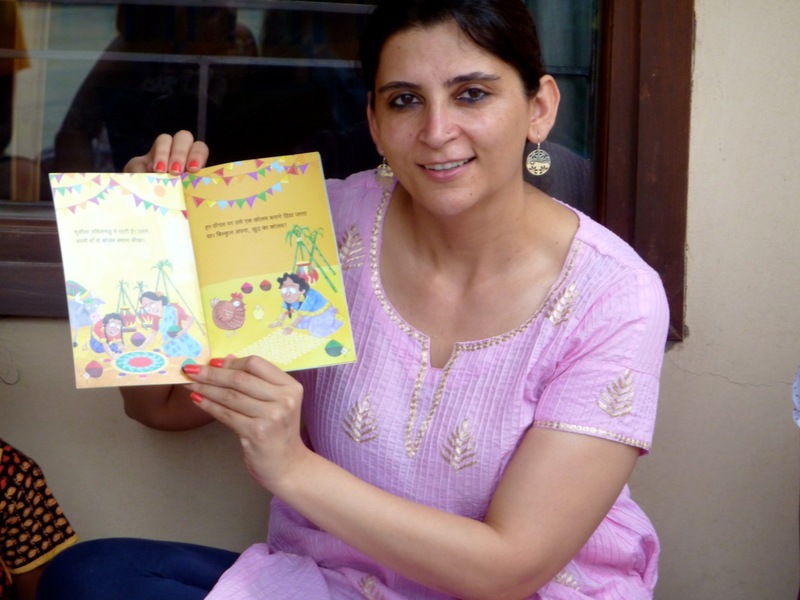 Vandana Kadyan is an educator with The Heritage School Gurgaon. Her friend Sonica Chabbra is a pilot with Jet Airways. They both spend their Sunday mornings reading books in their small little library. 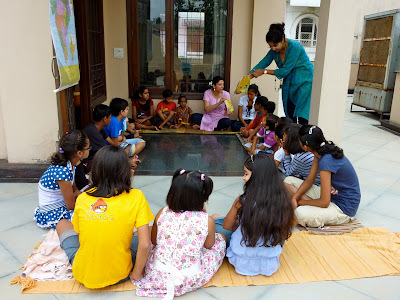 The library is an initiative started by Sonica in her Grandmom's house and is called Kamla Puri Memorial. The library has about 300 members and children come to borrow books on a weekly basis. 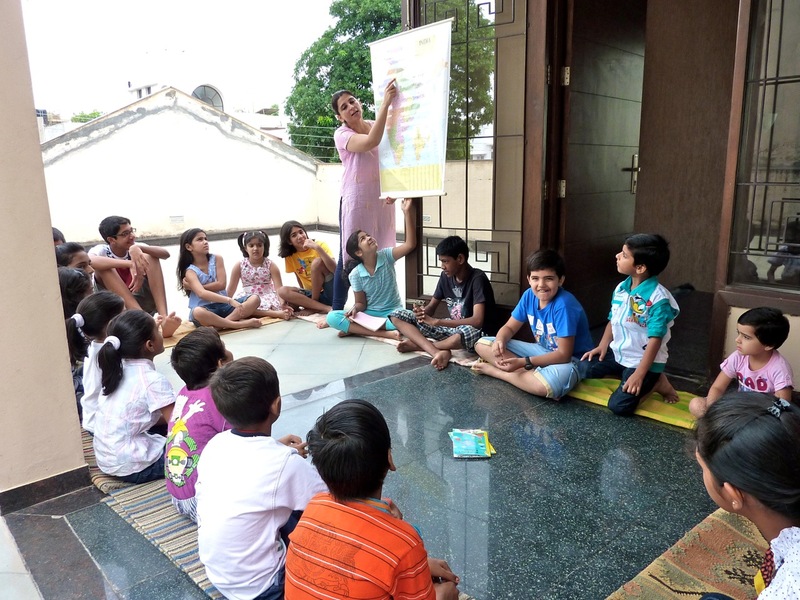 These children are basically from the Udyog Vihar workers families in Gurgaon. Sonica and I had one of the most beautiful mornings with the children. We took the story session in a small library run by Sonica. As it was a pleasant morning we spread the durries on the terrace. The number of children was about 25 between the age group of 4 to 11. Most of these children are from the government school of village Sirhol in Gurgaon. We started our session by showing children the map of India and asking them to look where we are on the map. Later, we told them that, the story we are going to share today is about a little girl, Sushila who lives in Tamilnadu. 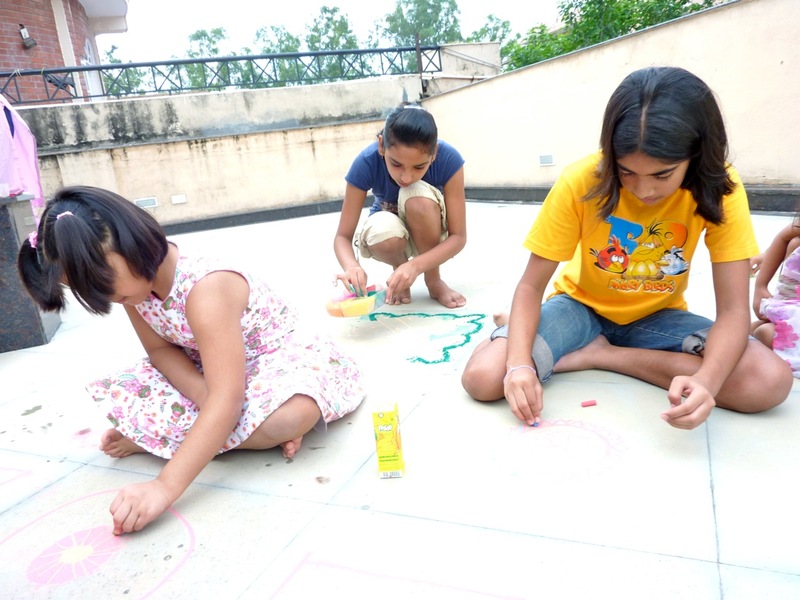 We asked children how they celebrate Diwali and what do they do to decorate their homes? We told them about a special festival Pongal that is celebrated in Tamilnadu and the little girl Sushila makes something really special for that festival. This helped us to build context and generate curiosity among the children. I read the story in Hindi and Sonica read it in English. 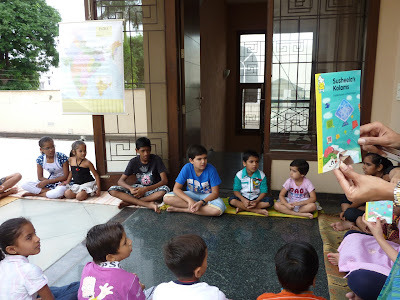 Children were totally engrossed and were spellbound by the pictures of Kolam designs. 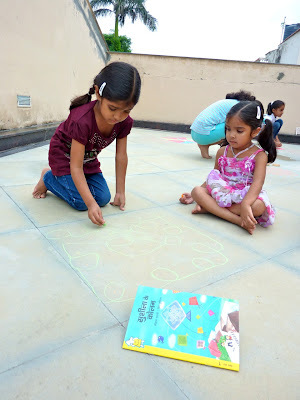 After the story we gave them coloured chalk to draw their own designs of Kolam. The terrace floor was filled with some amazing colourfuk designs. Believe me it was a sight they were all at it making beautiful designs. Thank you Vandana and Sonica for spreading the joy of reading!